Dublin, Ireland - Anti-Loyalist demonstrators gathered in Parnell Square to protest a "Love Ulster Parade" organized by the hardline loyalist group FAIR (Families Acting for Innocent Relatives). The mass of demonstrators, some of whom waved black flags, the Palestinian flag and the Irish tri-color, became violent when police tried to push the crowd down O'Connell Street. 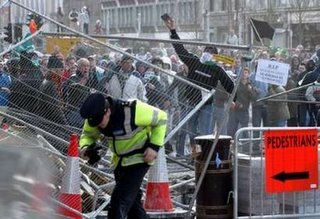 Protesters attacked Gardai police with paving stones, molotov cocktails, fireworks, and other miscellaneous projectiles including a wheelbarrow. 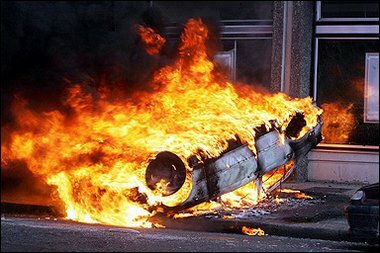 Rioters burned cars and smashed up British owned businesses, a police station, a number of banks, a political party office, and a McDonald's. Numerous police officers and demonstrators were injured in the clashes.